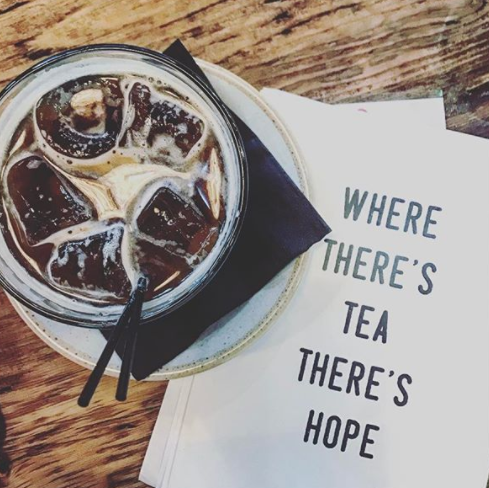 If you've read my latest post, you'll know that I'm collaborating with the Simplyhealth Great Manchester Run team to talk running in the lead up to the Great Manchester Run on Sunday 20th May (there are places still available!). Today, I'm sharing some of the best places in Manchester to go for a post-run refuel. Think post-run not posh, with carb-laden, delicious flavours and hearty portion sizes galore. 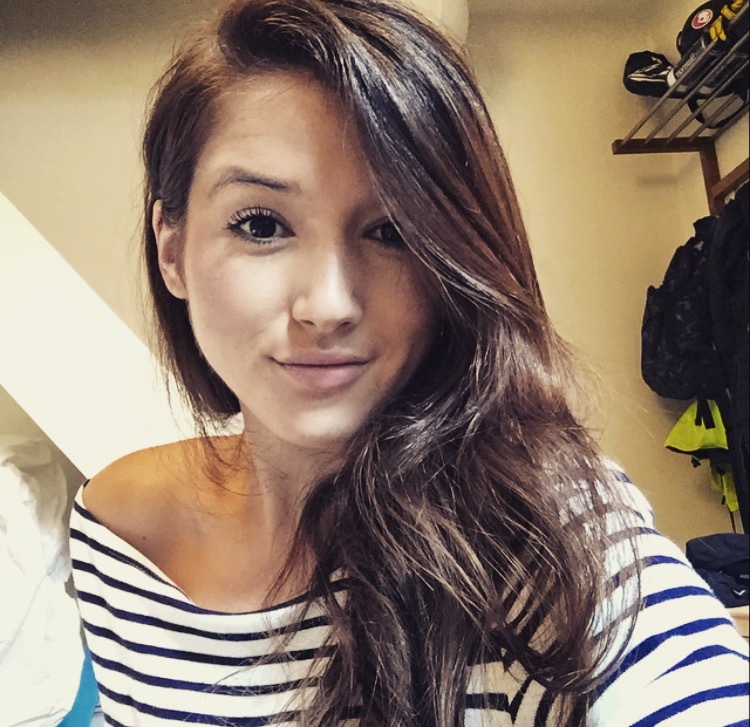 xIf you've read my last post, you'll know that I'm collaborating with the Simplyhealth Great Manchester Run team to talk running in the lead up to the Great Manchester Run on Sunday 20th May. 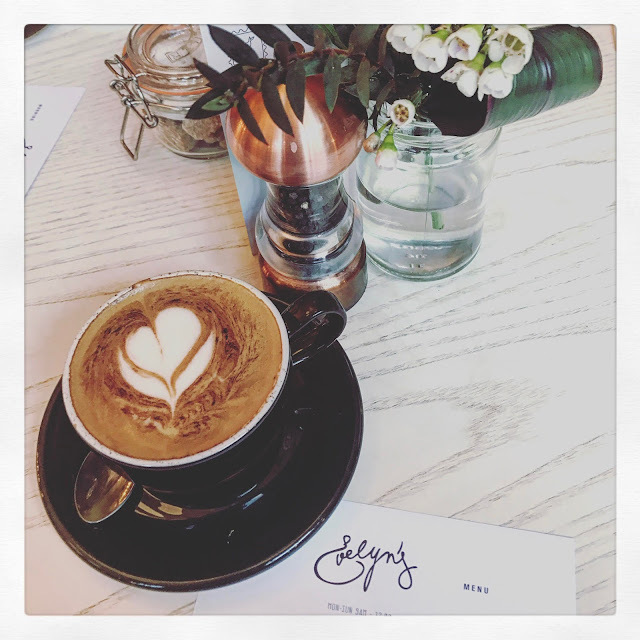 Today, I'm sharing some of the best places in Manchester to go for a post-run refuel. Think post-run not posh, with carb-laden, delicious flavours and hearty portion sizes galore. 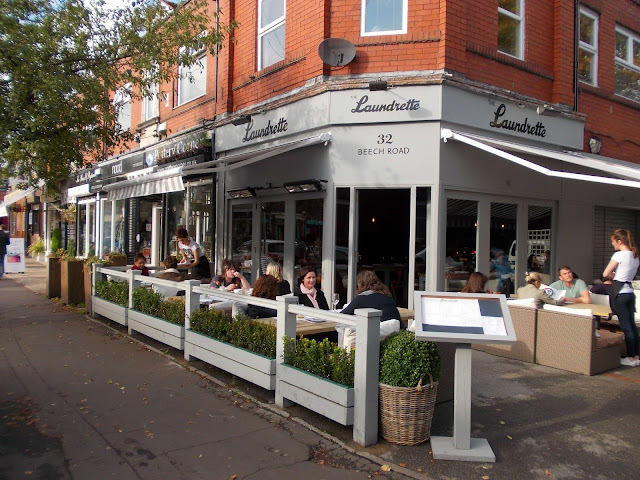 I'm starting this blog off by throwing it back to the post-run food I had after the last half marathon I did in Manchester in October, at Laundrette in Chorlton. I'd highly recommend a number of dishes, from pizzas to burgers and grain-based pimped up salads and their sweet potato fries are spot on. Get yourself across to Castlefield (not far from the finish line!) and order some hearty 'pub-grub'. If the sun's shining, they've got a lot of space outside so it's the perfect place to chill out for a few hours. Failing that and it does rain (it's Manchester, people..), inside is absolutely huge so getting a table shouldn't be a problem. If you're with a large group of people and can't make your mind up on what food you want, I cannot recommend Mackie Mayor enough. Artisan food stalls galore, set in a really amazing space designed for socialising. 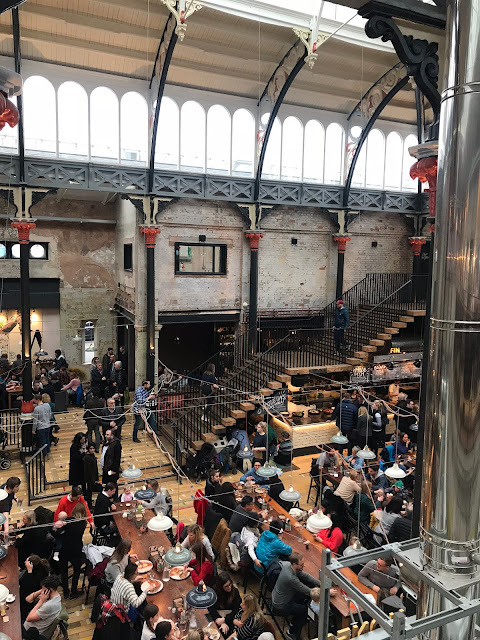 From the people who brought us Altrincham market, this former market dates back to the 18th Century and is absolutely beautiful. The bao buns from Baohouse are fantastic - very tasty, if a little pricey for what they are (about £7 each). The fishfinger sandwich from Fin Fish Bar is very good, and I've heard good things about the steak sandwich from Tender Cow, if you eat meat! 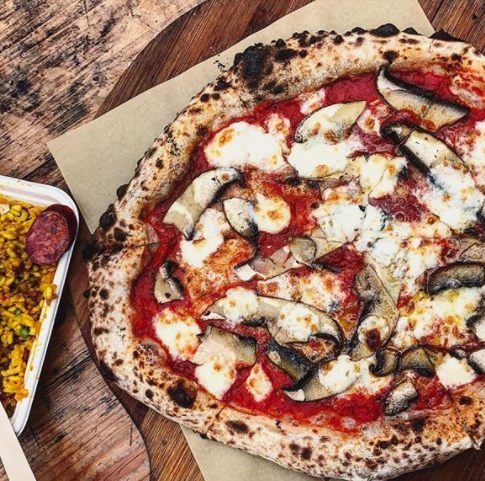 The pizza from Honest Crust's stand is not to be missed either. There's usually around four or five different variations and they're very reasonably priced. I can't talk about pizza (which seems to be a bit of a theme so far...) and not mention my all time favourite, Double 00. I've written an entire post on why you need to visit, but in a nutshell, their pizzas are AMAZING. Build your own or choose from their specially crafted menu, there's a topping selection to suit everyone (and it's BYOB...). Booking highly recommended as it gets very busy. Ahh, lovely Leaf. I used to work next door and would frequently pop in for coffee, brunch, lunch, tea... post-work drinks, the works. 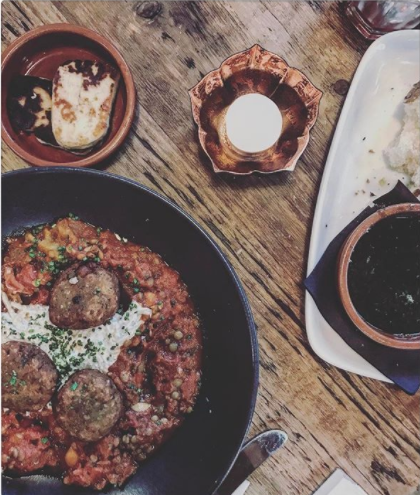 I've had the falafel and butterbean stew at least eight times and comes highly recommended. I'm also going to make a very bold claim here: their focaccia is the best I've ever eaten. The balsamic and oil glaze it comes with is life-affirming. I'd also recommend; the crispy fried salt and pepper squid, the Goan vegetable curry, Roast sweet potato, fig, feta and cashew nut salad (with fries, obvs) and falafel and halloumi flatbread. 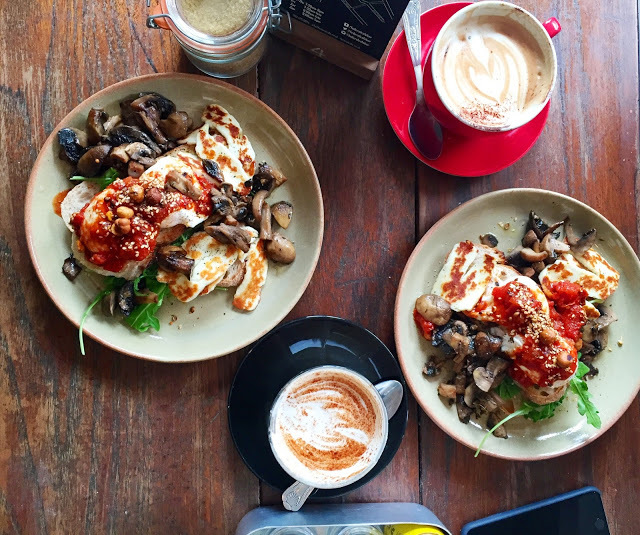 Breakfast wise, the shakshuka poached eggs and the veggie breakfast are equally as tasty. Should you really want to push the boat out, their afternoon tea is a winner, too. Essentially, something for everyone and the location couldn't get more central. If you're more of a sweet or dessert kinda person, Home Sweet Home is just the place. 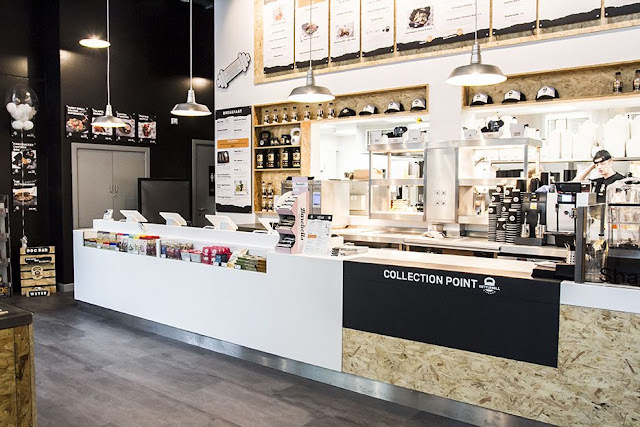 Again, conveniently located very close to the finish line (it's practically fate...), its menu of mouth-watering cakes, shakes, burgers and pancakes will not leave you disappointed. There's also one on Edge Street in the Northern Quarter, should this branch be full. Evelyn's is one of my all-time favourite spots in Manchester. I've written a separate blog post all about my recommendations, but in short, if you're a fan of botanical-industrial chic decor, hearty food with a healthy twist, you need to check it out. 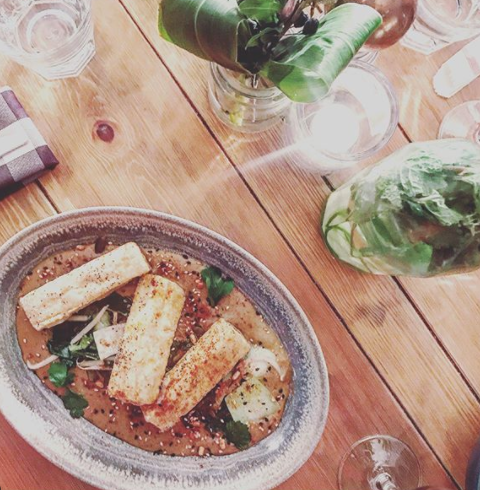 Favourites include: The crispy tofu and red pepper dhal, aubergine laksa with coconut, tuna poke and chicken skewers. Please also get the masala chips and saag paneer as these dishes are incredible. 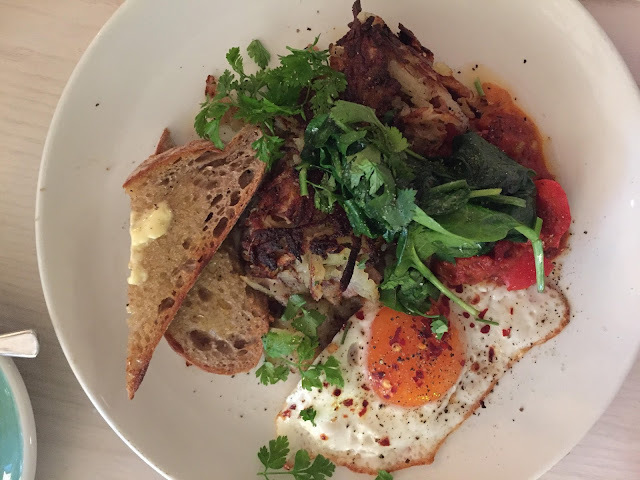 An Australian & New Zealand cafe bar, Federal has long been a go-to place for me to enjoy a lazy brunch (their brunch menu is served all day!) or lunch on a weekend. 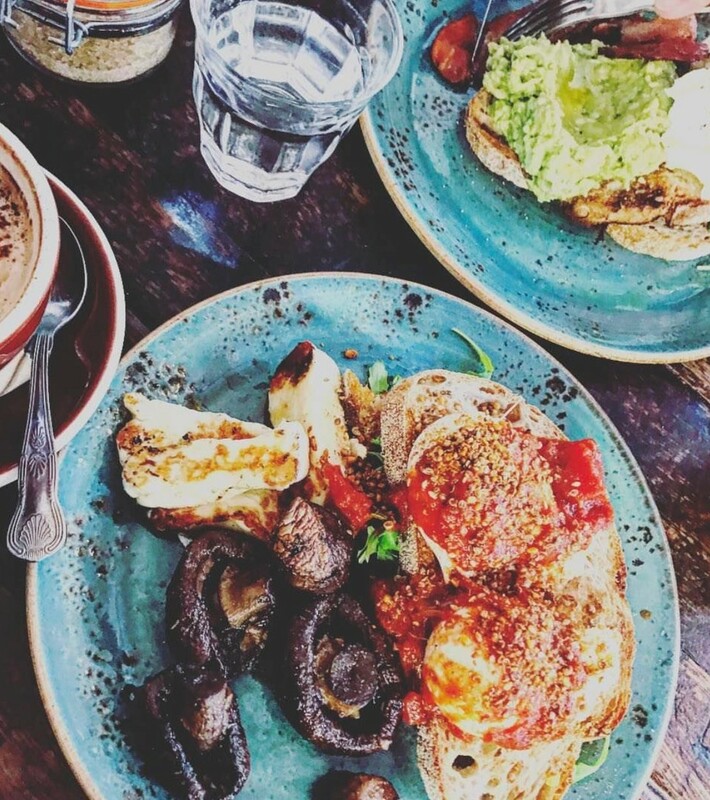 My personal favourites are; Emily's banana bread, French Toast (with whipped mascarpone and salted caramel omggg) and the Halloumi and Shrooms (my all time favourite - pan-fried halloumi, garlic and thyme mushrooms, free-range eggs, spiced tomato relish, hazlenut dukkah on sourdough bread). It's very small inside and so queues are often out the door but trust me, it's worth the wait. Taken from Bundobust's website as all my photos on my phone are so dark and don't do it justice..
To give you an idea of how much I like this place, I've been to Bundobust twice in the past three weeks. 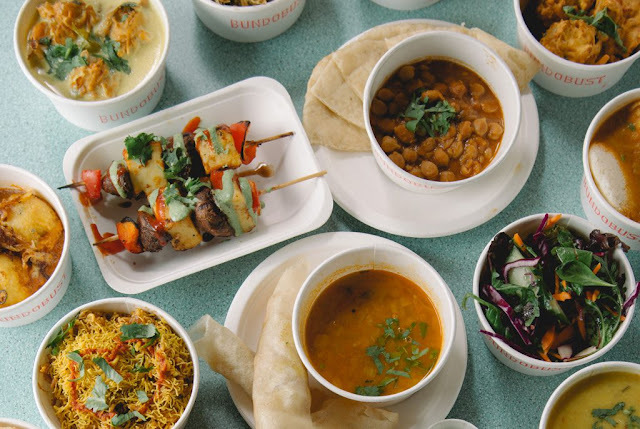 A 'critically acclaimed beer and Indian street food joint', it will not disappoint. 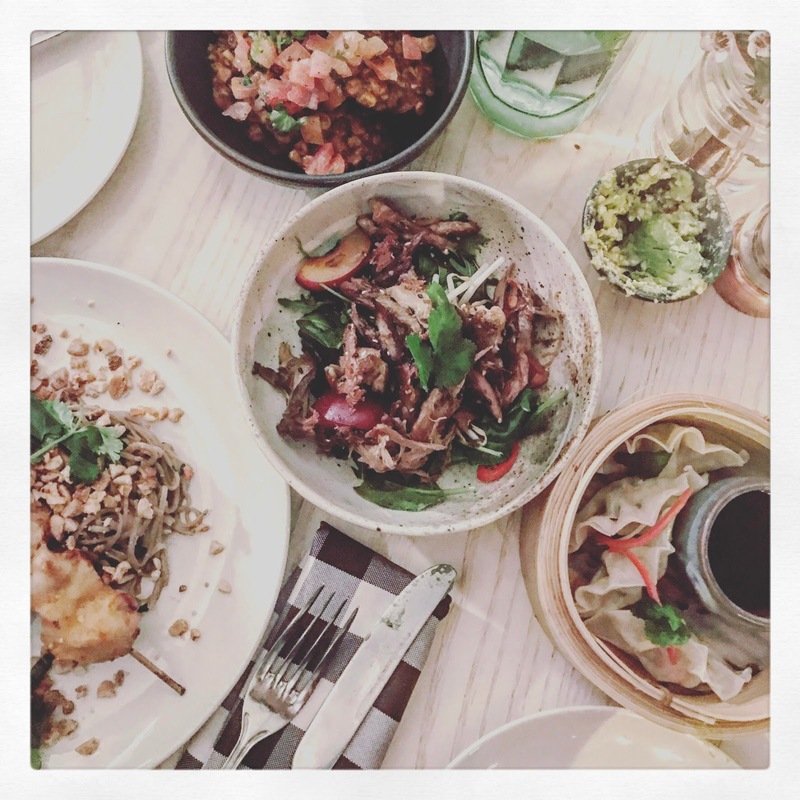 The entire menu is vegetarian but don't let that put you off if you're a meat eater, as each time I've been, I've been with meat eaters who've raved about how good it is and how they didn't miss meat. So if you're skeptical, please take my word! My favourites include the paneer and mushroom skewers, the okra fries, the chole saag and the Bundo chaat. 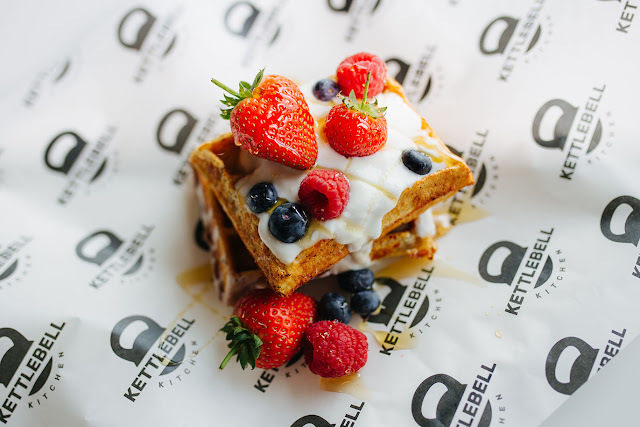 Kettlebell Kitchen pride themselves on healthy, fast-food so if you want food in a hurry, this place is a winner. 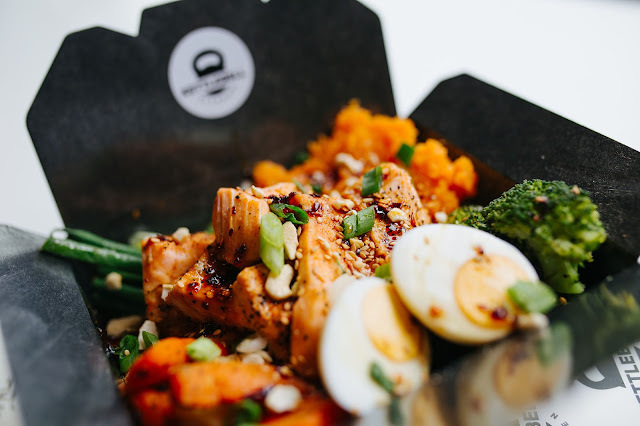 Their perfectly formed macro boxes are ideal for post-workout, and there are plenty of treats to choose from too. I couldn't find any photos on my phone from KB kitchen, so here's a selection from their website so you can see what all the fuss is about! These are the top ten places I'd recommend paying a visit to after you've endured a good, long run - go on, you deserve it!